We are an approved CAA Auto Repair Service Centre. Take advantage of special CAA discounts and further assurance in the quality and integrity of our repair work. Contact Autocare Signature Tire for your next CAA-approved Auto Repair. When your battery fails, a boost will often help you get to your next destination; but it does not fix the real problem. 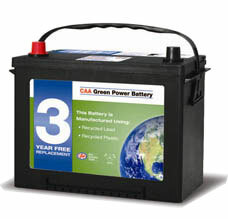 When this happens to you, CAA Mobile Battery Service will deliver and install a heavy-duty or premium battery that is right for your vehicle. If the battery does not need to be replaced we will not replace it. Over 99% of the materials in a spent battery can be recycled. After your old battery has been replaced, Autocare Signature Tire will take care of its disposal in an environmentally responsible way.